The fourth annual ARTISTS WITHOUT WALLS will open Sunday, March 3 from 12:00 – 3:00 pm with Artist Talks at 12:30 pm. 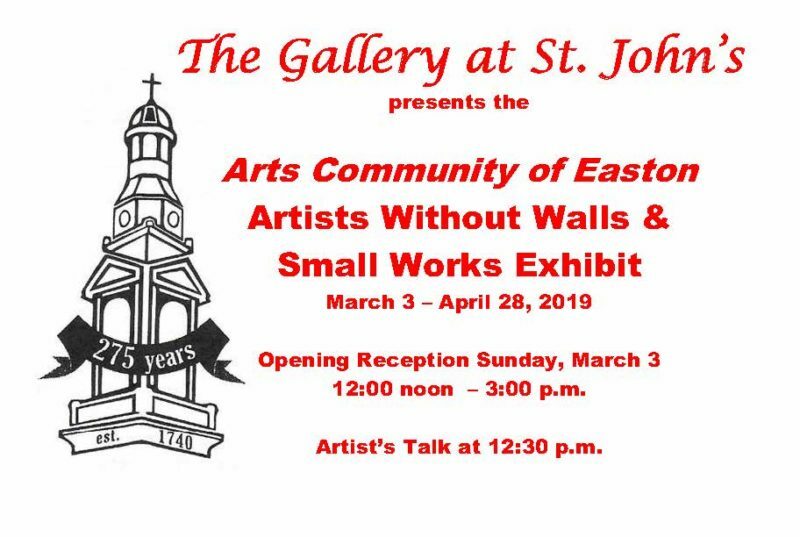 All exhibitors are members of ACE (Arts Community of Easton) who do not have studios of their own. This show runs through April 28, 2019. The Opening Reception provides an excellent opportunity to meet the artists and welcome them to St. John’s. Participating artists are: Lady Colleen Heller-Alrefai, Loretta L. Becker, Eileen Breslin, Linda Feula, Sylvia A. Woolf-Gallop, Rhémy M. Golab, Charles Hanson, Mara Levine, Howard McGinn, Mike Montalvo, Judy Moore and Shirley Shaffer. The variety of artwork will include miniatures, jewelry, oils, acrylics, pencil, watercolors, collages, pastels, floorcloths and photography. In conjunction with this show, the gallery will dedicate one wall to the ACE annual SMALL WORKS SHOW in which all artwork will be 8 x 10 inches or smaller. Maryann Riker will curate the small works exhibit.